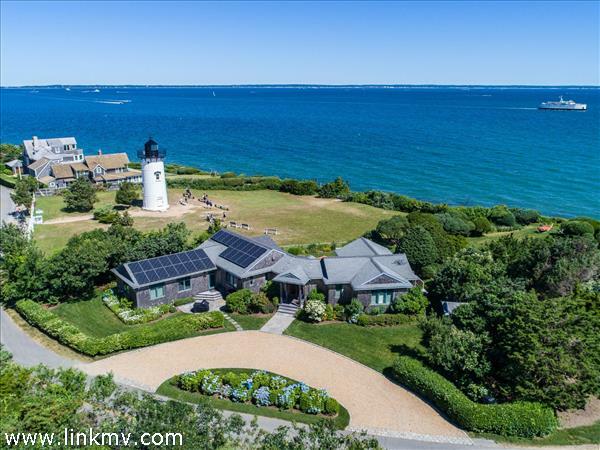 This Custom built home, with SENSATIONAL WATER VIEWS CONTEMPORARY DESIGN SITS HIGH ON A LANDSCAPED HILLTOP with penetrating views of Vineyard Haven Outer Harbor and Vineyard Sound to the coast of Cape Cod. This exciting residence, in PRISTINE CONDITION, includes most of the designer top of the line furnishings, has amazing SUNSETS over the Outer Harbor! Offering 2 master suites, a total of 5 bedrooms and 4 sparkling marble bathrooms (renovated 2016) SPACIOUS OPEN CONCEPT! Features include multiple private balconies, 3 porches, 2 car garage and parking for 8 vehicles, Granite fireplace, GOURMET KITCHEN (renovated 2016) CENTRAL AC, GLEAMING HARDWOOD FLOORING, media room, outside pond, mature plantings, and MANY QUALITY CUSTOM DETAILS THROUGHOUT! Comes with entertainment systems and TV's mounted on walls, and a security system installed. A special property, in a unique and historical location, that offers privacy and accessibility, as you watch the ferries come and go! 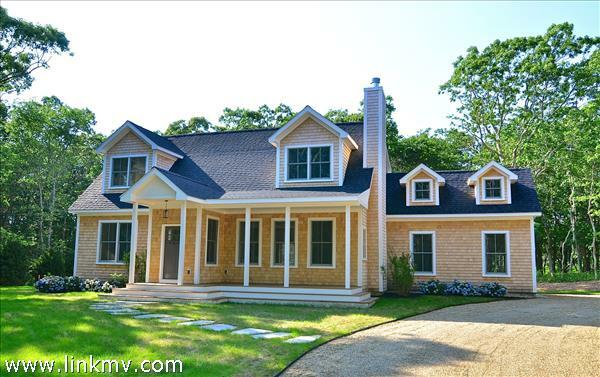 OAK BLUFFS - new, luxury enclave - The Preserve at the Woodlands!Enjoy the best of both worlds in this lovely area abutting 200 acres of conservation land yet centrally located off County Road near Farm Neck Golf Club with bike paths that provide EASY ACCESS into downtown Oak Bluffs, Edgartown and Vineyard Haven. 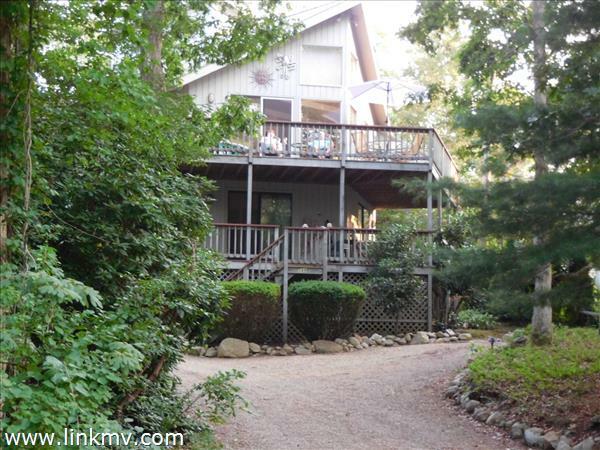 Relax and enjoy POND VIEWS and panoramic meadow views. 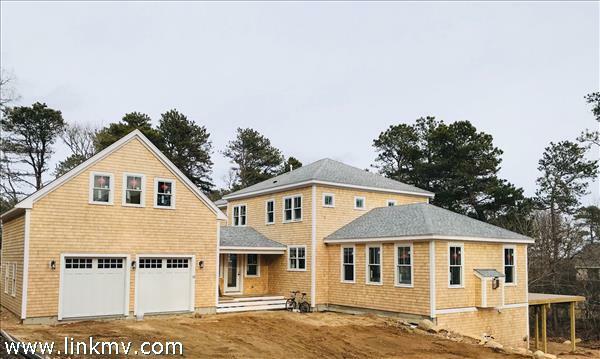 This HIGH QUALITY NEW CONSTRUCTION offers 5 bedrooms and 4.5 bathrooms with 9 foot high ceilings. The wooded 1.8 acre lot offers a spacious backyard with a bluestone patio for entertaining, outdoor shower and borders conservation land for complete privacy. The option to add a POOL is available upon request. An OPEN FLOOR PLAN features a large gourmet kitchen with a Sub-Zero fridge, Wolf range and other professional stainless steel appliances. The living and dining area has lovely views of the pond, custom built-ins and a gas fireplace. A first floor master bedroom contains an en suite bath, dressing area and walk-in closet. For your convenience, there is a first floor laundry room, mud room and powder room.Upstairs there are four SPACIOUS bedrooms - two of which are master bedrooms with en suite baths and vaulted ceilings. The two additional bedrooms share a hallway bathroom with double sinks. Two of the bedrooms offer pond views. There is an additional washer and dryer upstairs.Enjoy UP-ISLAND PRIVACY with DOWN-ISLAND CONVENIENCE! Don't miss this opportunity to enjoy this beautiful INVESTMENT property and begin to earn income right away. Or enjoy it all year round yourself with family and friends!! MOVE IN READY!! 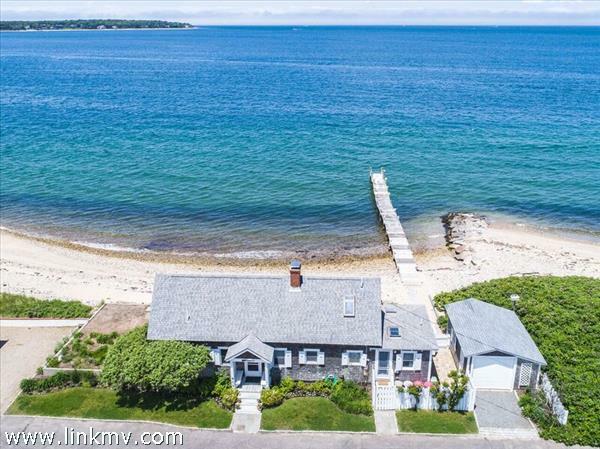 Smell the sea and touch the sky from this unique vintage waterfront home on East Chop.Extraordinary views of Vineyard Sound from every room with ocean breezes flowing through to Crystal Lake. You can watch the sun rise as you bathe in the antique tub and then watch the sun set from the patio or master suite. Your private 120' dock, mooring and sandy pebbled beach are the perfect place to enjoy all the beauty and water activities that make the Island a special place for generations of family memories. On the ground floor there is an open floor plan with a central kitchen, living and dining area flanked by two bedrooms. The master bedroom is en-suite with a sitting area that opens up to spectacular views of the blue water. The second bedroom on the first floor is a cozy enclave with a private half bath. The open kitchen has ample room to prepare breakfast, lunch and dinner - eat in the attached dining nook or alfresco on the brick patio. Upstairs there are two additional bedrooms and a full bath. There is a detached garage with a large cedar-lined closet for storage. 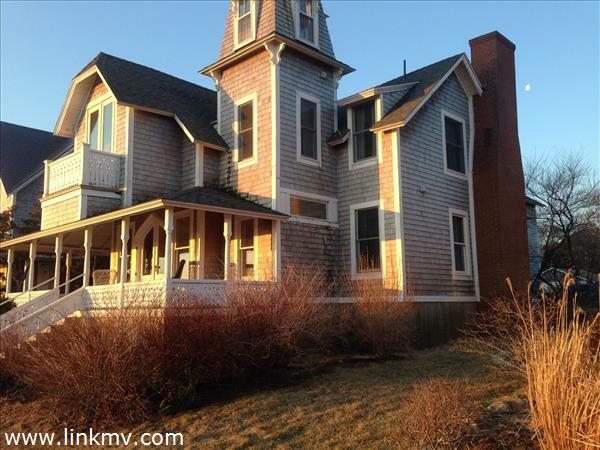 This magnificent home is located within walking or biking distance of downtown Oak Bluffs. Being offered turnkey and has a solid rental history. 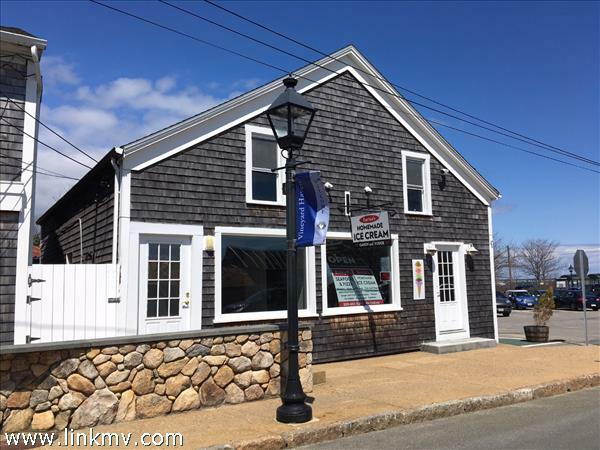 Sparkling newly renovated mixed-use commercial building in a prime and bustling location in Oak Bluffs. 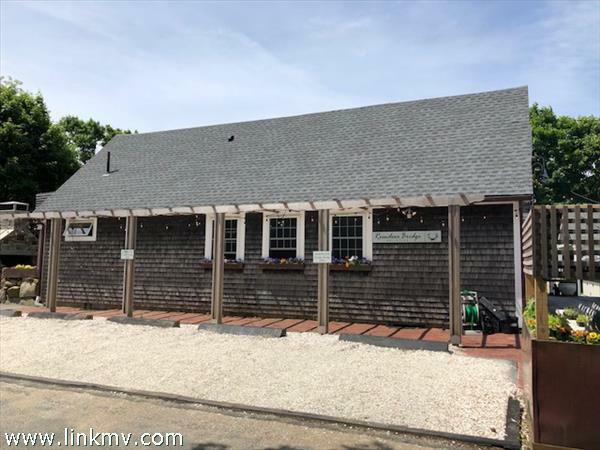 Looking to bring your restaurant concept to Martha's Vineyard? This is the perfect turn-key opportunity for a discerning restaurateur. Having been completely rebuilt from top to bottom with design work by Sullivan + Associates, the building is now intelligently configured for use as a high-end restaurant with cocktail bar, espresso bar, seating for up to 99 people, state of the art commercial kitchen, retail space, full commercial basement, and three gorgeous apartments upstairs. Originally built in 1900 and once used as an AandP grocery store, the current owners completed extensive renovations from 2012-2014, bringing the property to an exceptional level of finish and quality. The building meets all fire codes, handicap accessibility requirements, and health regulations, and was thoughtfully engineered to be weather and sound proof. Since the renovations, the property has been operated for four summer seasons (roughly one full year) and is in mint condition. 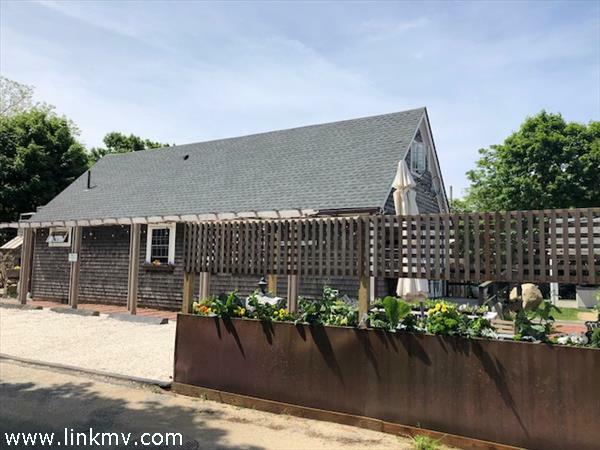 Truly a vibrant and irreplaceable offering in the absolute perfect location for high-end bar/restaurant on Martha's Vineyard. 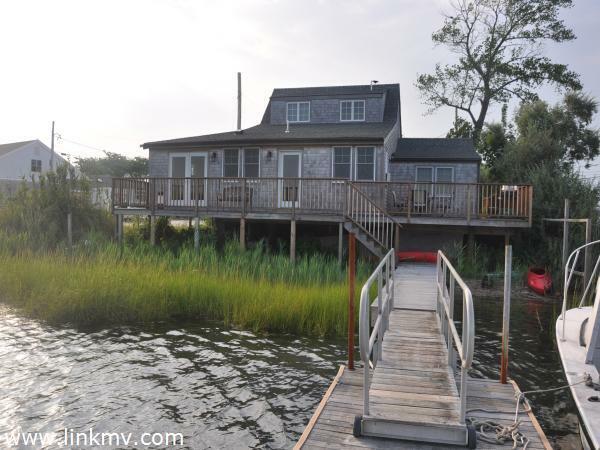 Top of the Chop ~ A stunning contemporary with dramatic sweeping views of Vineyard Sound. A complete transformation by South Mountain and Company of the former residence resulted in a masterpiece of modern living and superb style. Upon entering you are immediately greeted with water views and the breathtaking landscape and it continues to unfold as you go through the home. The single story home was designed with the living and entertaining area at the core with the master wing tucked privately away and a two bedroom guest wing down its own corridor. The baths are luxurious, the kitchen a work of art and the finishes throughout are simply exquisite. East Chop is an upscale summer community, a most ideal location with the beach, harbor and town just a short distance away. Well appointed 4000+ sq ft Contemporary home surrounded by a little more than one acre of lush landscaped greenery on Lagoon Pond with private beach and potential for a dock. Spacious 3 bedroom 5.5 bathroom with high ceilings, two first floor offices, open living/ dining areas all with views of the Lagoon. The large gourmet kitchen. Sweeping waterviews from every room. 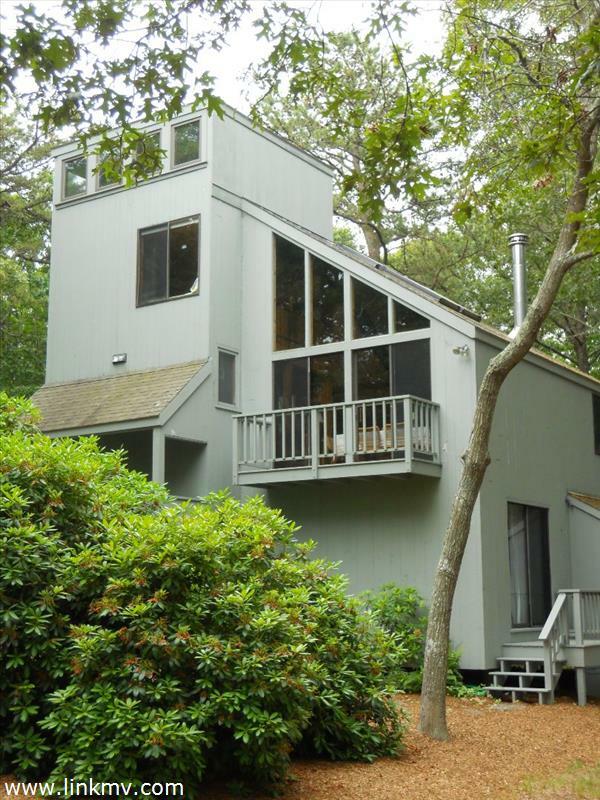 A wrap around deck and a screened sun room adjoins the upstairs bedrooms. Full basement ready to be finished. This house has spacious rooms perfect for entertaining . Being sold mostly furnished. 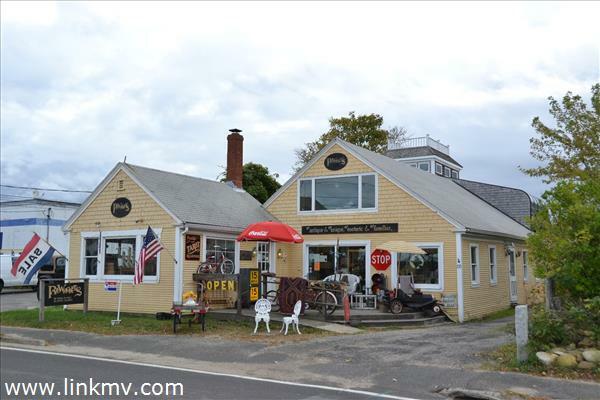 Property is near Cronig's Market on a paved road and access to town water. Owner is motivated. Build a starter home or a house for your employees. 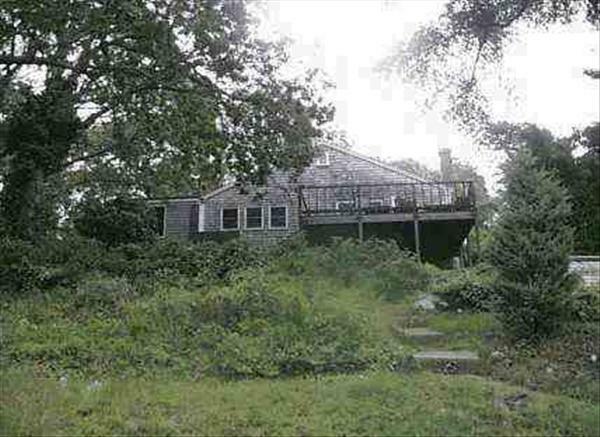 There is a septic design for a three bedroom home which will need to be renewed with the Tisbury Board of Health prior to installation. The owner has staked an estimated building site on the lot. THE BUILDING SITE HAS NOT BEEN SURVEYED. Owner will close as directed by the attorney as stated:(1) This agreement is subject to approval of the seller's attorney (2) This approval may be arbitrarily without recourse to the seller. 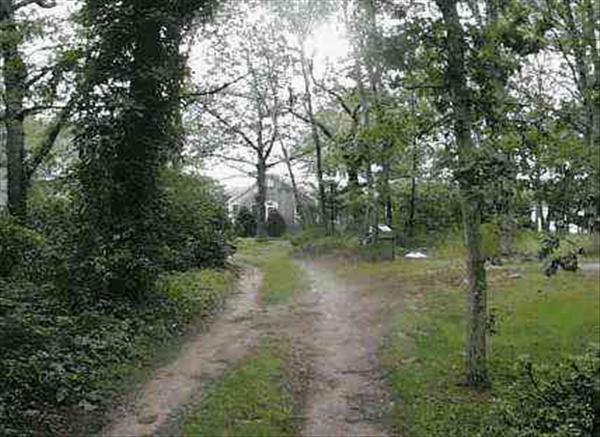 Vacant, Wooded ,32 acre, level homesite on Tashmoo Avenue, a quiet side street with very little traffic minutes to Main Street Vineyard Haven shops, restaurants, Harbor, and Steamship terminal. Bayliss Woods is a Neighborhood, located at the end of Tashmoo Avenue, of recently built substantial three and four bedroom homes on a paved street with protective covenants. 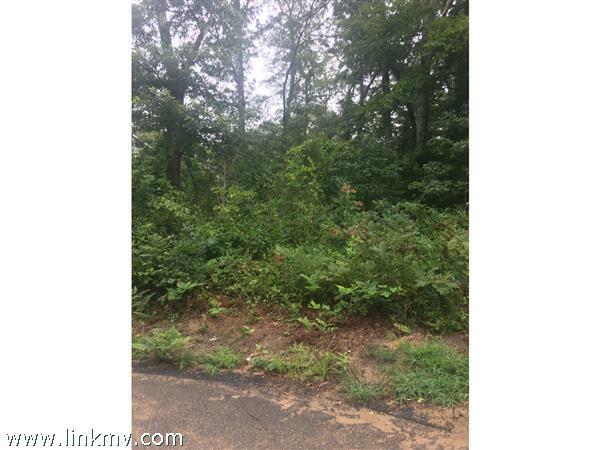 Beautiful Lot located in the TASHMOO AREA! 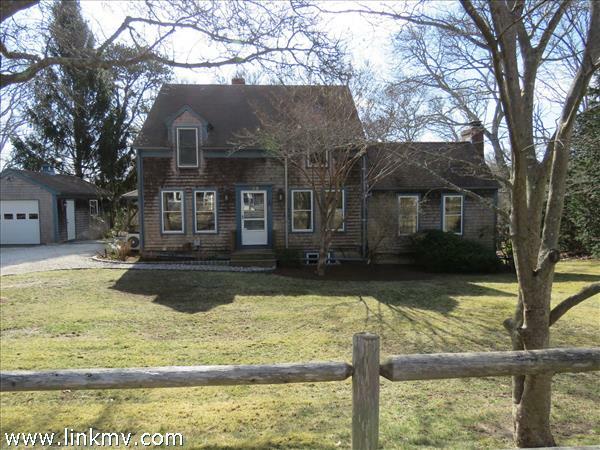 This is a great area in Vineyard Haven, located close to the town, Elementary school and Ferry. 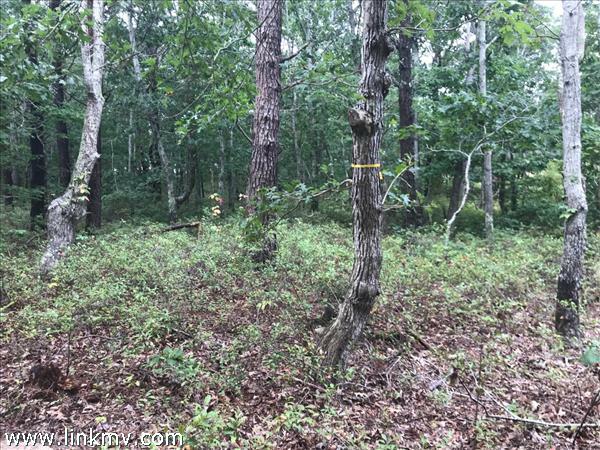 On .34 Ac this lot will allow you to build your dream home ,along with, up to a 600 Sq ft guest house.A very short walk to Tashmoo boat landing. Centrally located to all that downtown has to offer. Per the engineer, this lot does not have any restrictions on the number of bedrooms allowed. Per the engineer, this lot DOES NOT need an enhanced septic. The guest house may be built first with main house needing to be a min of 2100 sq ft. So much more to say regarding this lot please call to inquire on just what this lot can offer. Rate of development permit for this lot is 2019 but can be switched among the family members that own each lot. Build your own special Vineyard home on this lot. The house is a tear down, property is being sold in "AS IS" condition. 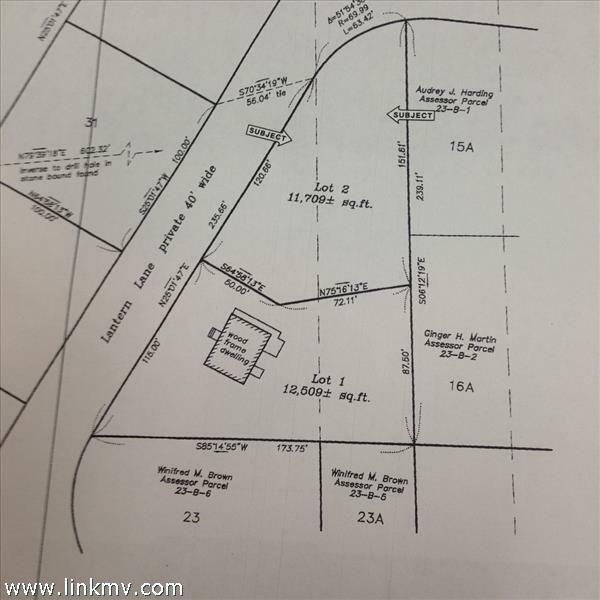 Nice .58 acre lot can support house and guest house. House has structural and foundation failure. The 3 bedroom septic was installed in 1999 and passed inspection 11/2018. 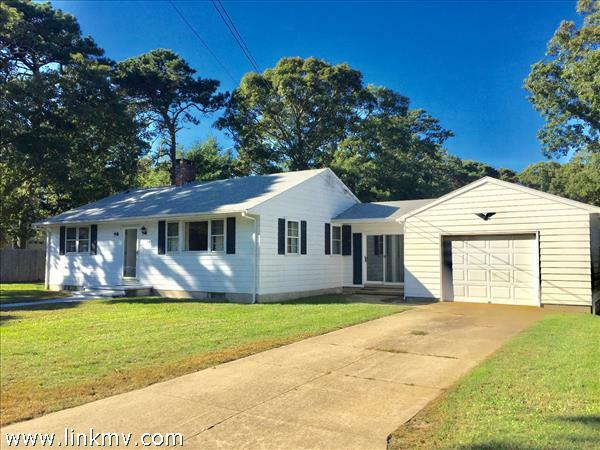 Stroll to down town Vineyard Haven in just 15 minutes from this delightful Mid-Century home in an equally delightful neighborhood! 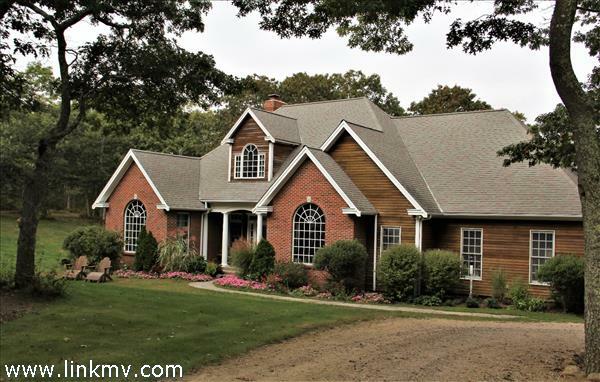 Move right in to this pristine property, diligently maintained by the same owner. 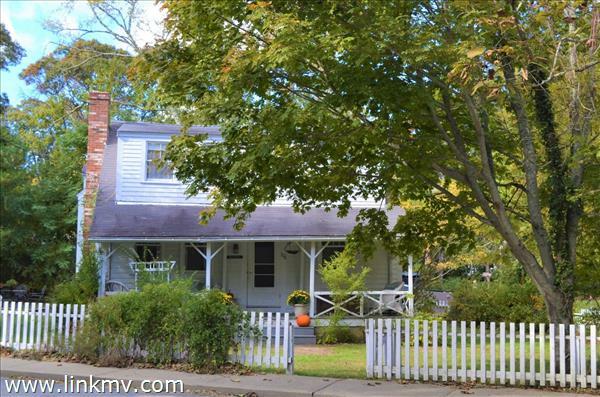 Highlights include a cheerful interior with great natural light, beautiful oak floors, new Harvey windows, an attractive kitchen, an enclosed porch, a new Weil McLain boiler and oil tank, and a new septic system to be installed by the seller. No shortage of storage or expandable space here - there's a full 38' x 27' basement, an attic, AND a 23' x 16' garage. 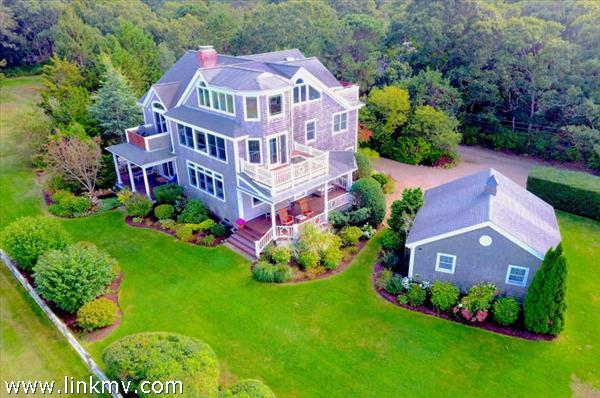 All this and just minutes to the library, yacht club, town dock and beach. Be sure to capture this rare opportunity to own such a property in this price range! A tremendous value for a legal duplex. A great income producer! With today's rental rates, perfect for employees orsplit between two families or rent one live in the other! Making your way to school, ferry and all the conveniences of downtown will be a breeze from this super-bright and inviting home on a barely trafficked dead-end lane. 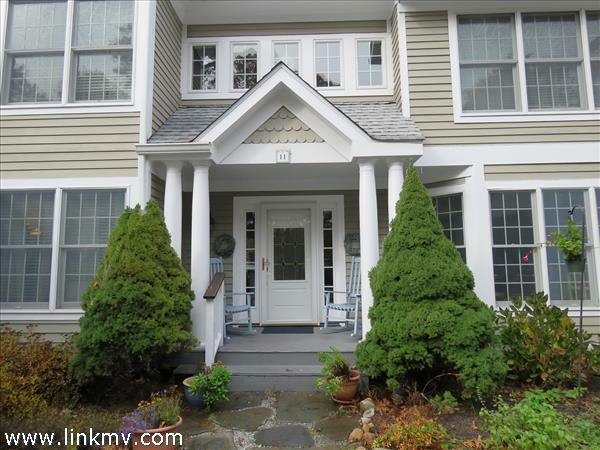 Built in 2000, the house is charmingly appointed, smartly laid out and impeccably maintained. Maple floors, oversized windows and a handsome wood stove are among the quality finishes. And what a relaxing backyard you'll enjoy from your deck and patio. Mature lilacs, butterfly bushes, hydrangea, a showy Rose of Sharon and a host of perennials burst forth in color, in season. The parcel is generous enough to add a detached garage and, with town approvals, perhaps an apartment above? A Title V 3BR septic system is in place. If replaced by an enhanced system, the property can qualify for additional bedrooms, per the Tisbury BOH. The little house that grew AND can grow even more---an Accessory Apartment in the finished lower level IS POSSIBLE with Town approvals. With a finished 2nd floor, an additional 527 sq. ft. of finished space in the lower level (NOT reflected in the ELA above) and a deck for entertaining, this cape-style home lives large and has been successfully rented in season for 10 years. The property is conveniently located near Town and ferry as well as tennis and the Town boat landing on Lake Tashmoo. Fully renovated with an eye to low maintenance, features include bamboo floors throughout, marble in the baths, carpeting in the lower level and Veranda composite decking for the deck area. Windows are all new Andersens and the kitchen and baths feature granite counters. The home has been thoughtfully set up for ease of rental with a separate owner's closet off the 2nd floor King bedded room and another owner's closet off the shower bath in the lower level. There is even an owner's lockable full size fridge in the utility area of the basement! The home is being offered Turnkey except for personal items and includes back ups of many essentials when renting. This is a great opportunity to simply walk in and get started!IF an Accessory Apartment is important, the existing septic system has sufficient excess capacity to allow a 4th bedroom per the BOH. Town approvals needed. 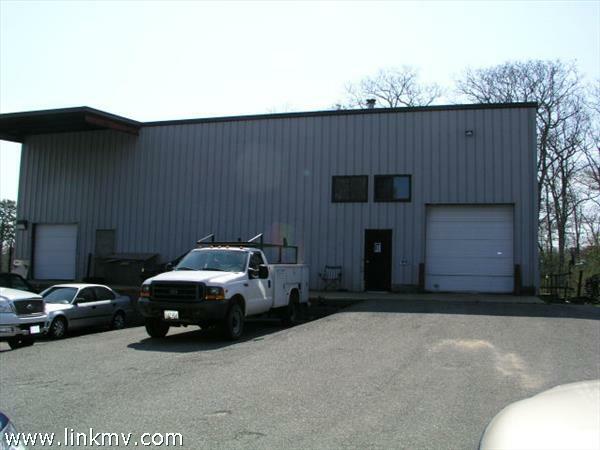 Possibilities abound with this special offering with great commercial space. Located in the B2 corridor on State Road. 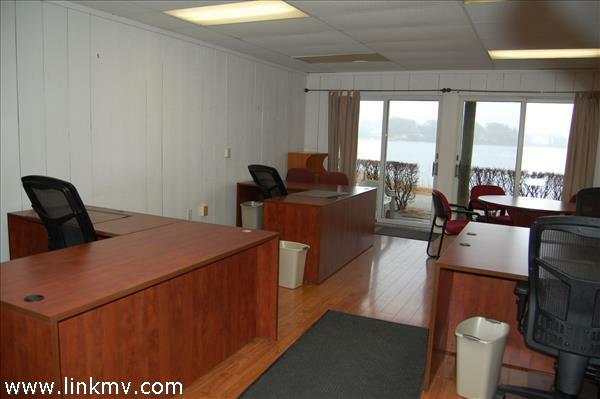 The main floor offers nearly 800 square feet of commercial space with an office, full bath and kitchenette in the back. A large, dry basement with 9ft ceilings and interior access offers an additional 900 sf of useful space. There is a attractive patio/sitting area out front with a handcrafted pergola running along the side that brings you to the cozy back patio with a custom stone fireplace. There are 7 parking spots and a finished second floor. Possibilities abound with this special commercial offering. Located in the B2 corridor on State Road. The main floor offers nearly 800 square feet of commercial space with an office, full bath and kitchenette in the back. A large, dry basement with 9ft ceilings and interior access offers an additional 900 sf of useful space. There is an attractive patio/sitting area out front with a handcrafted pergola running along the side that brings you to the cozy back patio with a custom stone fireplace. There are 6 parking spots and a finished second floor. 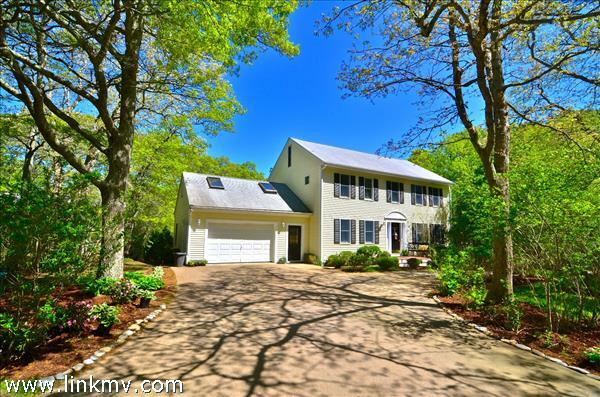 Newly listed in West Chop! Come see this 2,718 s.f. home located on a quiet side street. So many nice details including a beautifully landscaped, fenced-in yard and a BRAND NEW kitchen you'll never want to leave! The first floor open living room / dining room with fireplace and French doors lead to an arbor covered patio. A second floor great room has cathedral ceilings and skylights. The property has functioned as an established B and B and has excellent rental income history and potential. The perfect house and yard for entertaining! Must be seen. Priced to sell....call today! 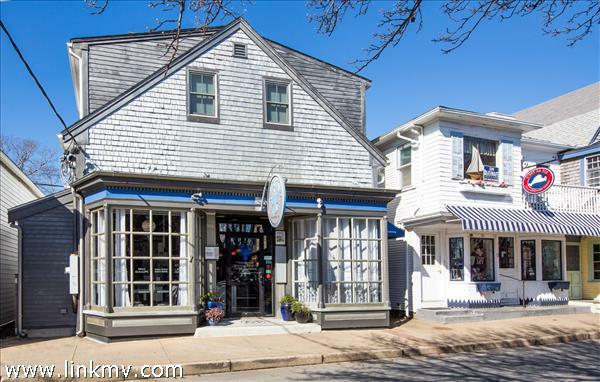 Vineyard Haven Charmer! 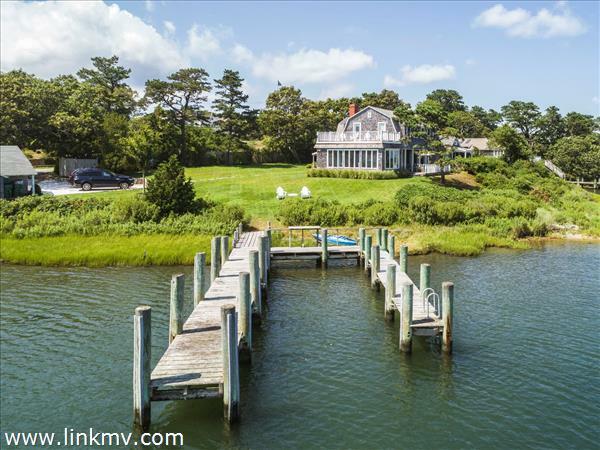 This five bedroom home is located steps to the Vineyard Haven Yacht Club. Warm and welcoming, sit on the front porch and watch the world go by or enjoy a fire by the wood stove. There have been many upgrades through the years, including a new kitchen, and three upgraded bathrooms. 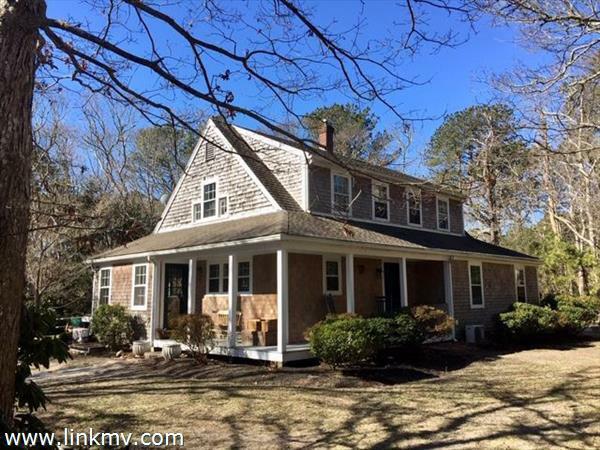 Wood floors,vintage charm, five bedrooms, two bull baths, two half baths, full basement, and oil heat.This is an amazing location within close proximity to town, beaches, and Owen Park. This is a true gem.Septic has passed Title V inspection. 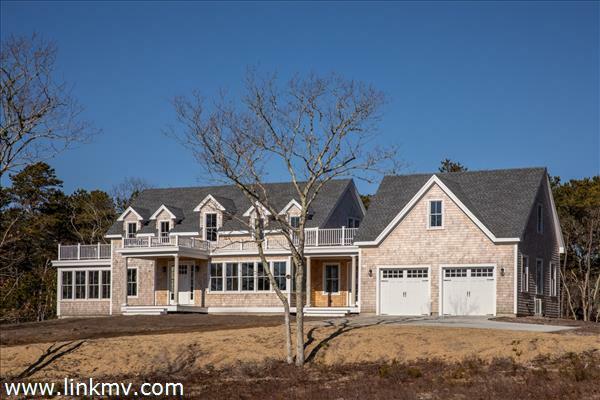 The best kept secret on the island, Tashmoo Woods offers year-round living in a community of 100 acres and is surrounded by miles of walking trails, 15 acres of association beach on the Vineyard Sound, 4 tennis courts and association swimming pool. This tastefully appointed townhouse has had numerous upgrades over the years. A new gas fireplace is the center piece of the comfortable living area with cathedral ceilings and wonderful light coming from all new Andersen windows. The dining area has newly built in display cabinets. The remodeled eat-in kitchen is finished with granite counter tops and stainless-steel appliances. All three bathrooms have been redone, with the master bath featuring a double sink marble counter top and decorative tile. A new heating system has been installed, with an automatic system for heat control and monitoring while away. There is a partially finished walk out basement that would make a wonderful media room or exercise space. Furnishings are available for purchase separately. Generous useful building envelope lot on Main Street extension in West Chop. Rarely does a lot of this size and privacy become available within a short distance to The West Chop Club. 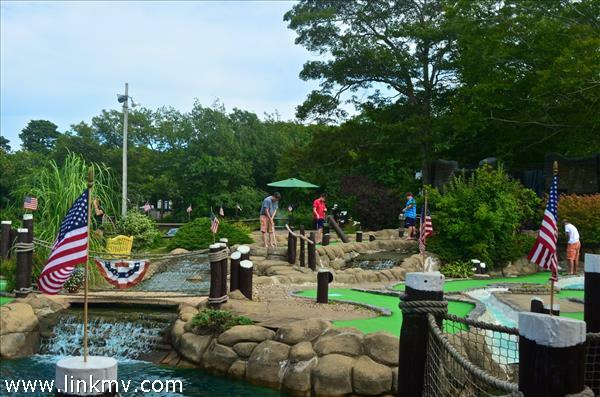 The lot is also near the Mink Meadows Golf Club, Herring Creek, Lake Tashmoo, and Vineyard Haven. 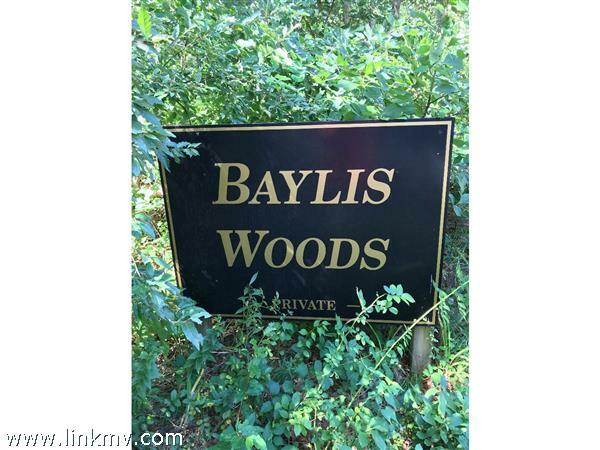 Wooded lot contains lovely, mature oak trees that provide a natural high canopy and shade. Please call listing office for actual dimensions of the portion of the lot for sale. This an opportunity not to be missed! 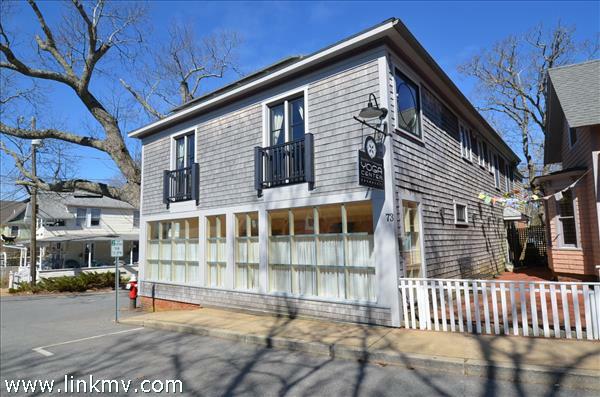 Unique multi/mixed-use Commercial and Residential building set on the waterfront of The Lagoon in Vineyard Haven. View of and Minutes from the Ferry, Harbor and Town. Building was completely renovated in 2007. Residential portion has an open plan living/dining/kitchen with unobstructed views of the Lagoon. Custom kitchen with Granite counter tops, Maple Cabinets, Stainless Steel Appliances, Brazilian Cherry Floors and Travertine tiled bathrooms w/radiant heat. Ground floor Master Bedroom with view over the Lagoon, en-suite with aerated tub, custom tile and radiant heat. 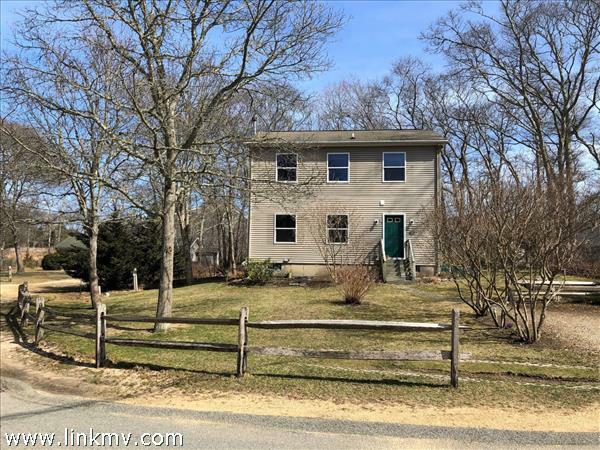 Second Master Bedroom upstairs with en-suite, aerated tub, custom tile, radiant heat and private deck overlooking Vineyard Haven Harbor. 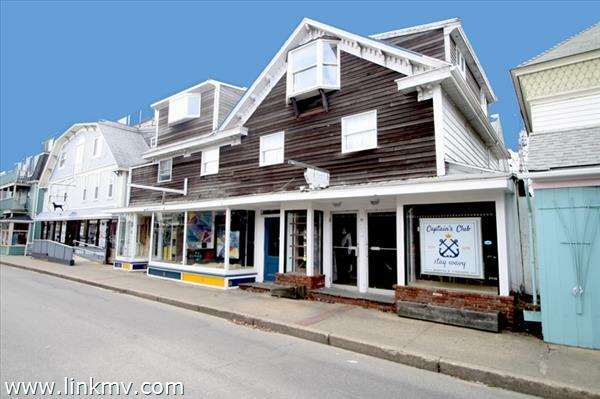 Commercial portion has large retail space with views over the Lagoon and Vineyard Haven Harbor. Approximately 550 sq.ft. of office space, consisting of two rooms, one running the length of the building from front to rear and the second room has double doors and a private bath. Front entrance to Commercial side of the Building has a covered handicap accessible ramp and steps. PIER with FLOATING DOCK which can be extended. Six parking spaces are allowed. Connected to Town Sewer, property is allowed to have three bedrooms. Photos were taken prior to current tenancy. TENANT in PLACE. MAIN HOUSE AND APARTMENT ABOVE 2 CAR GARAGE - Charming two bedroom cottage fully renovated and move in condition, with welcoming farmers porch, and pleasant yard for outdoor entertaining. Designed with an open kitchen, dining room and living room floor plan, the main living space is bright and cheery. The pellet stove in the living room adds to the coziness of the room. The master bedroom is tucked in the back of the house with a door to a private deck and hot tub. The second bedroom is behind the living room and also offers privacy. There is a partially finished basement for overflow living space. The piece de resistance is the over sized 2 car garage and one bedroom apartment above. Built in 2005, this space can be used for extended family and guests or as a rental. Conveniently located to Town and the ferry, and being sold furnished, this is a must see property. Potential, Potential, Potential!!! 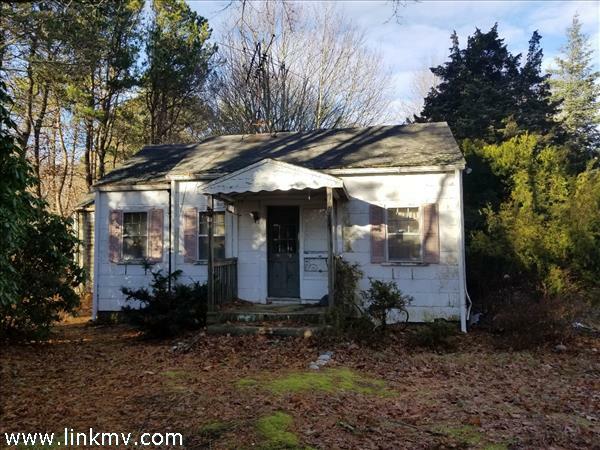 This well maintained, year round colonial 3 bedroom home sits on a lot large enough to have either a 600 sqft guest house, or a garage with a 1 bedroom apartment above. High ceilings, a living room, a family room, formal dining room, kitchen, breakfast nook, and mud room with half bath are all on the first floor. On the second floor you'll find the Master suite, complete with walk-in closet and bathroom, two more bedrooms and a hall bath. The walkout basement boasts an office, 10' high ceilings, and is waiting to be finished off to create more living space. 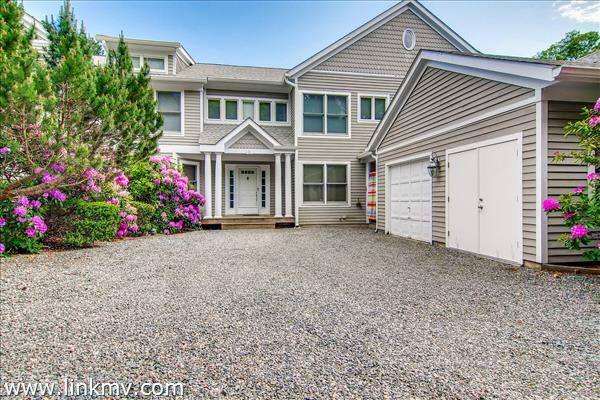 Hardwood floors, ample closet space, new 4 bedroom septic, and access to Tashmoo Opening Beach and community tennis courts are all a part of this lovely home. 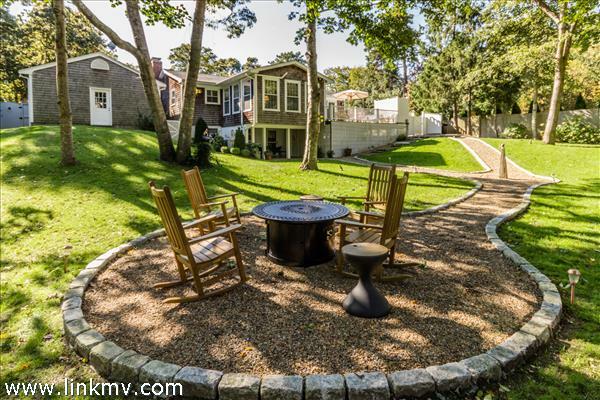 Top-of-the-line Tashmoo Woods townhouse with access to all the association amenities. This updated year-round condo is in meticulous condition. The vaulted cathedral ceilings in the Great Room allow for natural light to pour in through the oversized picture windows. The eat-in kitchen was renovated with all stainless steel appliances, soapstone countertops, and travertine tile floor. There is plenty of outdoor deck space for entertaining and because this is an end unit, privacy is assured as there are no neighbors in sight. Tashmoo Woods offers year-round living at its best. 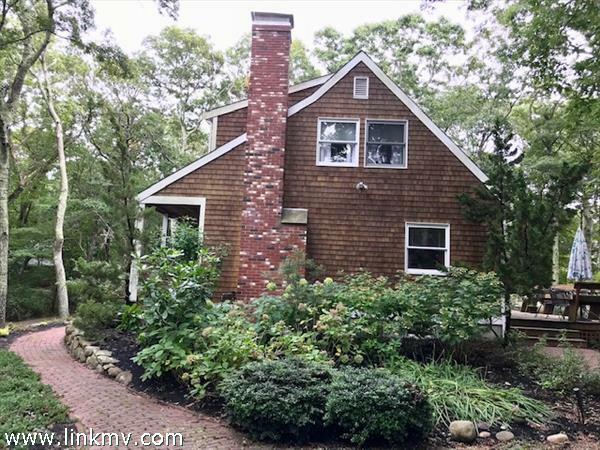 Tashmoo Woods sits on 100 acres and is surrounded by several miles of walking trails, 4 tennis courts, association swimming pool, 15 acres of association beach on the Vineyard Sound, and a small boat landing located on Lake Tashmoo. 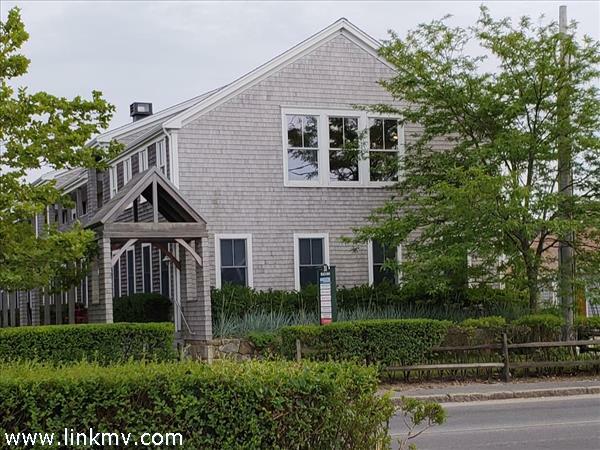 Tranquil and private, this community is nevertheless just a short distance to the vibrant village of Vineyard Haven with its restaurants, movie theater, and shopping. Please contact broker for direction to summer exterior images. 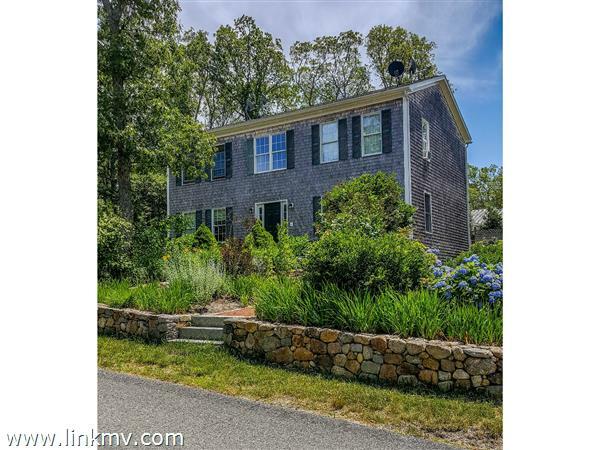 SET ON A QUIET CUL DE SAC - A Classic Cape home, with a modern flair, set on a lovely 3/4 acre lot less than 1.5 miles to Main Street, Vineyard Haven. 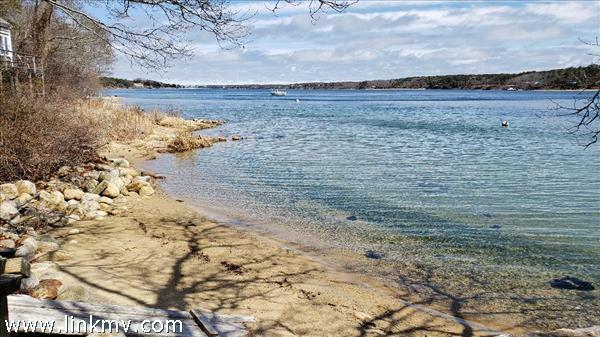 This home has the best of both worlds, close enough to Main Street, restaurants and the Ferry, far enough to have a parcel of land large enough to accommodate the existing two car garage and the addition of a future Guest House. This three bedroom home has an excellent layout providing clearly defined spaces, an open floor plan, yet enough separation to allow separate functions. Updates including but not limited to new flooring in high traffic areas, newly painted kitchen cabinets, new countertops. 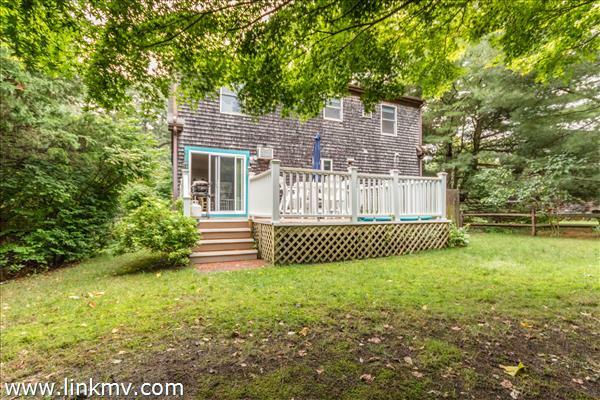 Spend most of your Summer in the wonderful screened in porch right of the kitchen. Remainder of main level has a large living room with hardwood floors and the luxury of a wood burning fireplace, the heart and hearth of the home! Also a full bathroom with laundry. Upstairs to three bedrooms, master with a huge walk in closet which could also be modified to add an ensuite bathroom. Two guest bedrooms, one with a skylight, and a second full size shared bathroom. Each bedroom has oak floors and oil forced hot water heat throughout. Guest House of up to 800sq.ft. is allowed to a qualified applicant. Existing Two Car Garage ...for cars, additional storage or a workshop! There's also a full, poured masonry, 1,000sq.ft. plus basement with Rinnai Monitor propane heat and exterior access. Very well maintained yard. Outdoor shower. Easy to show. Access to a number of walking/hiking Trails. SURPRISING! SIX Bedroom, FOUR Bathroom, Four LEVEL home with a LEGAL apartment, walk up ATTIC and a GARAGE, in excellent condition. This large Single family home with Accessory Apartment has been tastefully renovated, with a lovely front yard, huge back yard and a wonderful deck for entertaining. Main level has three different living spaces including a large eat in kitchen with painted cabinets, granite counters, movable island and stainless steel appliances. Open plan kitchen and dining area is so large it accommodates a dining table for up to 10, as well as banquette seating! There's also, a living room and a den/tv room, a full bath and a laundry area in terrific mudroom. Upstairs there are Four bedrooms including a Master with an Ensuite complete with jet/soaking tub and shower. Three generous sized guest bedrooms share a full bathroom. Walk up to a huge, bright, functional Attic space. Back on the main living level, the dining area leads out to an enormous mahogany deck with Outdoor Shower overlooking a huge back yard. APARTMENT: Two bedroom accessory apartment on lower level with interior access and walk-out to 'patio' area and back yard. Open plan living room, kitchen with dining area and a full bath. Garage can be used for storage, has a separate entrance and a room above which would make a terrific home office. Walking distance to Tisbury School, town and Ferry. This is a lot of house and must be seen. Title 5 Certification for a 6 Bedroom system in place. 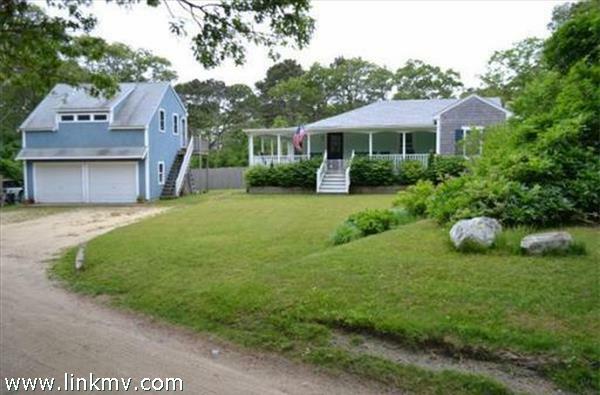 Charming expanded cape located in a very desirable neighborhood of Vineyard Haven. 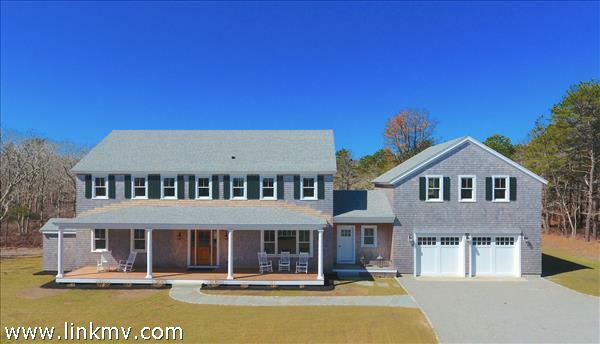 This spacious year-round home contains 4 bedrooms/4 baths. The first floor features an open kitchen, full bath, dining room, large living room with fireplace and a wall of sliders to private deck, den with fireplace and sliders to deck, and small cozy sitting area. The upstairs consists of large master with fireplace and private bath, plus two additional bedrooms with shared bath. The fourth bedroom is on the lower level with bath and private entrance. 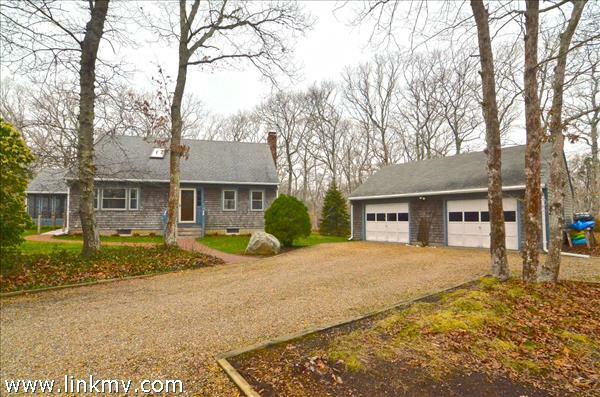 Nicely landscaped exterior with picturesque stone walls and one car garage. All of this within walking distance to town and ferry. Furniture is available for purchase separately. This versatile four level home maximizes space for easy, fun living. Enjoy an open combination/living room/kitchen that opens up to an expansive deck, ideal for summer dining and entertaining. "Treetops" features a special room at the very top of the woods, perfect for the afternoon nap or reading! This low maintenance home is a perfect summer getaway in an ideal location tucked away off Main St. 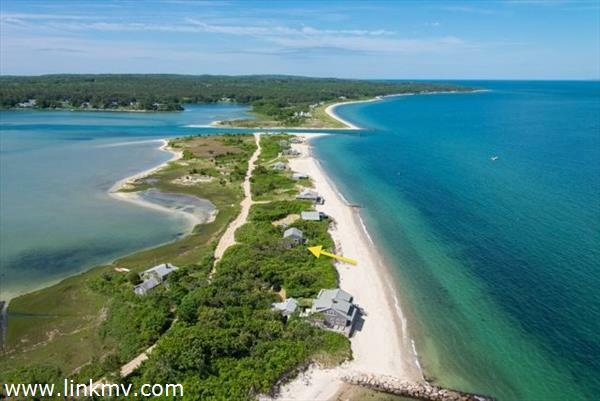 The 1.2 acre lot abuts 85 acres of conservation land and jogging paths.. Close proximity to the West Chop Club, Mink Meadows Golf Club, Lake Tashmoo, and Vineyard Haven are an added bonus! 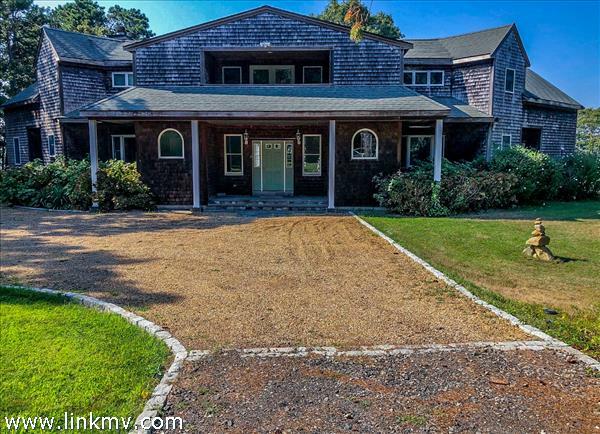 This is a perfect home for the sports enthusiast with easy access to fishing, swimming, clamming, bike riding , and of course, a leisurely walk with views of the Sound. 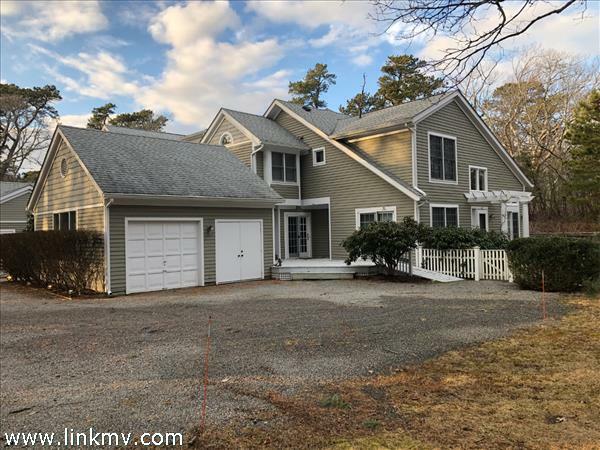 THE ULTIMATE VINEYARD EXPERIENCE - Move in ready, close to town and the ferry, 4 bedrooms, open kitchen, sun room, deck, and a fabulous back yard professionally landscaped with an essential fire pit perfect for evening entertaining. The charming home is ready for you to move in and experience Vineyard living at its best. Set back from the road behind a clam shell driveway, the one-story appearance only represents the first floor of this architecturally renovated and professionally designed interior and landscaped yard. It shines in style, design, and finishes from one end of the home to the other. The open flow of the kitchen along with the connected dining room and cathedral ceiling living room visually and pragmatically double the living space. A "must have" is the master bedroom on the first level. This home has the luxury of a library that could also be used as a bedroom. The lower level has been as beautifully finished and includes another living room, well-planned storage, two guest bedrooms, and a full bath, with its own outdoor patio.The park-like landscaping is a secluded space with a path to a fire pit, for evening entertaining. An over sized one car garage with ample storage is the finishing touch.